To make 1080p/720p/480p/360p YouTube videos, you can simply choose "YouTube Presets." 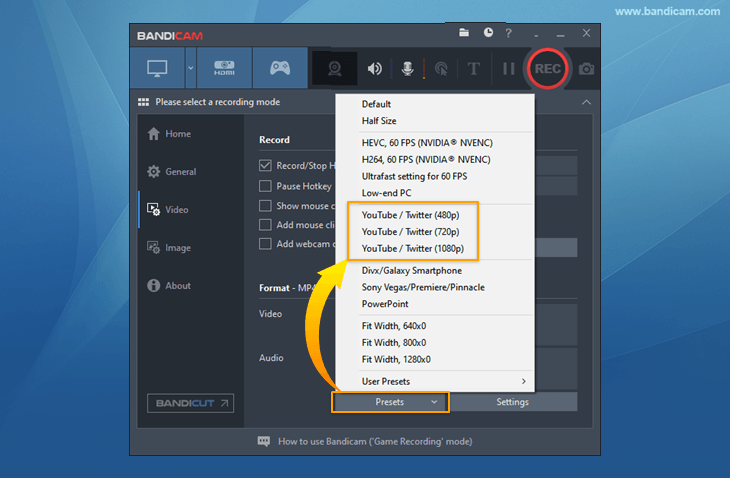 Go to the Video settings menu of Bandicam, and choose the "YouTube (1080P/720p)" preset. 2. If the "Upload to YouTube.com" window closes after clicking the Upload button, set your computer time correctly. 3. The maximum file size for YouTube uploading is 64GB. 4. If you see the "Unauthorized" error message, please create a YouTube channel and try it again.